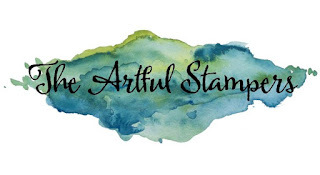 It's time for another blog hop, and this time I'm hopping with my team of sister Stampin' Up! Demonstrators, the Artful Stampers. We are focusing on the new 2018-2019 Annual Catalogue, so hop along with us and see what everyone has come up with. My project is a combination of new and "old" products, as in some have carried over from previous catalogues. I first created the background by stamping the Tree Rings background stamp with Versamark onto Watercolour Paper, then heat embossed it with White Embossing Powder. I sprinkled some Brusho Crystal Colour powders on the embossed panel then spritzed it with water to activate the crystals and give a watercolour effect. I used Brilliant Red, Gamboge (Orange) and Yellow. Once that was dry I cut the panel down and matted it onto black cardstock and then layered it onto my card front of Poppy Parade, a returning colour for this catalogue. I changed my mind a couple of times with the trees - first I die cut them out of black cardstock, then I thought they were too heavy so I decided to stamp them in Whisper White craft ink. That didn't give me the effect I wanted, so I decided to try Copper embossing powder over the top of the Whisper White ink. This has given a mottled effect, which I like. The greeting is stamped with the Whisper White craft ink and then heat embossed with White Embossing Powder. 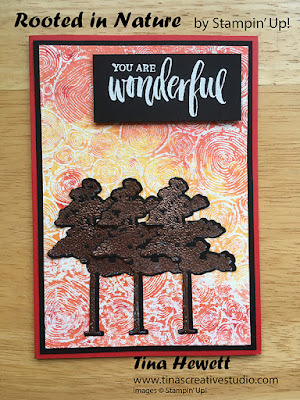 I used Stampin' Dimensionals to mount the greeting onto the card front. Here is a list of supplies I used to make my card. If you need anything, just click on the image to be taken straight to my online shop. I'm sure you'll be inspired by all the gorgeous projects today.